Rivet Networks has launched its new Killer 1550 Wireless-AC Module. Today the firm announced that its new faster Wi-Fi product, created in collaboration with Intel, will start to become available in gaming systems and motherboards from industry leaders such as Dell and MSI. Of note is that this is the first PC wireless module to feature 160MHz support and is capable of theoretical max throughput speeds of 1.73Gbps. Rivet claims the Wi-Fi speeds delivered are twice as fast as competing products. 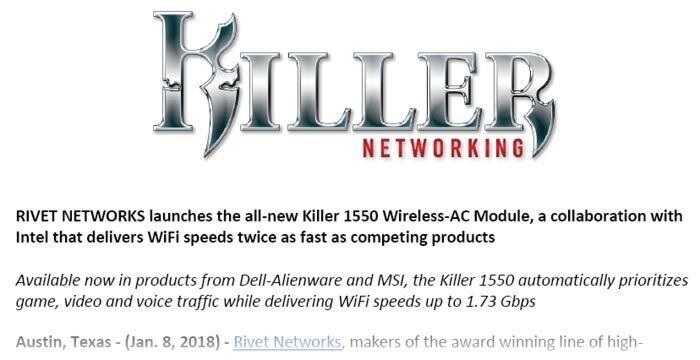 The new Killer 1550 Wireless-AC Module is described by Rivet as “the perfect implementation of Killer Networking’s speed, intelligence and control designed into Intel’s most advanced wireless chipset”. It combines Killler Networking’s speed, intelligence and control software with Intel’s most advanced wireless chipset. Thus it can automatically detect, classify and prioritise critical network traffic for online games, streaming video and high-quality audio. Gamers can expect their online traffic to be most highly prioritised to minimise latency. On the topic of the software, the Killer Control Centre is said to be significantly updated. Now it lets users manage priorities by category, in addition to specific applications and websites. Inside the control panel you can see the bandwidth used by your applications and websites and this allows users to make informed decisions about adjusting priorities and setting bandwidth limits. To save users considerable time and effort 500 websites are automatically detected and you can add tweak settings and add your own favourites. Users of Killer DoubleShot Pro might be glad to hear that the Killer 1550 is compatible with being used in conjunction with your Ethernet connection to allow multiple Wi-Fi connections. You can even set different apps and websites to use different available connections. The Killer 1550 comes packed with Wave 2 11ac features such as MU-MIMO and Transmit Beamforming to deliver strong signals over longer ranges. Bluetooth 5.0 is included in the wireless module. Starting today Dell’s Alienware laptops will begin to be sold with Killer 1550 Wireless networking installed, and MSI said it had started to deploy PC gaming products with “even faster and more stable online experiences,” thanks to Killer 1550 too. Can it be put into “monitor mode”?